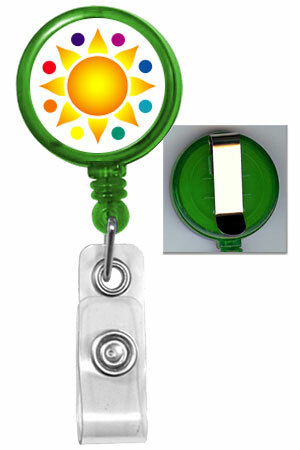 BR1TL Translucent Badge Reel with custom logo. Slide-type belt clip on back. Cord length is approximately 30" long. Clear vinyl strap with snap for card attachment. Custom Logo area is 3/4" in diameter. Reel diameter is 1-1/4".